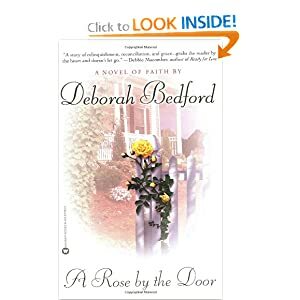 A Rose by the Door by Deborah Bedford is the first book I’ve read by this author. I really enjoyed this novel and would definitely pick up another book by this author! A Rose by the Door tells the story of a mother who has lost her son 5 years earlier when he walked out of her life and hasn’t returned since. His body is returned after his car accident, but his mother isn’t given a chance to explain her love or her motivations for acting the way she did years ago. Pent up anger and longing for her son encasing her heart, she must face the predicament of the young woman and little girl who show up on her doorstep, bedraggled and without a home. Can Bea find a corner of her heart to open up to this young girl and her mother, or is her heart frozen shut with the loss of her son. What is the secret that she is hiding? Will the telling of it free her from her self-imprisonment? “The dry, dusty distance had claimed her, had whispered its awful lie to her and made her believe it – a song sung, a story ended, a dark dirge of separation that repeated itself in broken litany over and over again.” (pg. 128-129, A Rose by the Door) Without knowing who or what the “dry, dusty distance” is, you wonder, don’t you? Even while reading the book you wonder at the personification and the beauty of the words placed together in so memorable a manner. “…Bea placed Nathan’s baseball inside the chalice of the little girl’s hands.” (pg. 183, A Rose by the Door)Can’t you just picture how this must look, but even beyond that, the importance the little girl placed on baseball for her hands to have formed a holy sepulchre? “As Gemma walked home from work late that afternoon, everything around her seemed to whisper “Three weeks…Three weeks…Three weeks.” The words rustled from the lawn grass beneath her feet and the leaves in the trees overhead and the green acorns that skittered along the walk when she kicked them. “Three weeks…Three weeks.”” (pg. 187, A Rose by the Door) Obviously the author wanted to emphasize the time span and the effect on this character’s life, but she does so in a way that seems so natural yet is so effective. The time limit she has placed on Gemma almost becomes another character that she must battle against. Another foe in the story. While I was fascinated by the many different turns of phrases in this novel, I believe what made them so fascinating was the originality of the descriptions and phrases. I believe the author was less effective when she used repetition of a particular phrase a couple of times in the story: eg.”He said there was nothing better than waking up in a place to make you feel like you owned it. Morning is fragile, he said. Makes you belong to something in a way that someone who hasn’t slept over never would.” (pg. 327 et al A Rose by the Door) I thought this was brilliant the first time, but by the second time it was already used up. I imagine the author used it to emphasize these words by the deceased character as how else does a deceased character speak than through the remembrances of others? Repitition would serve as an emphasizing tool, but I don’t like it in this book. No other reason than I like the orginality of the phrase and want to see it only once. My only question at the end of the story in relation to plot was: Whatever happened to Bea’s husband, Ray? Why was he discontent and what impact did this have on the other characters besides the obvious implication of the plot? We know it affected Bea, but what of the boys, other than the obvious effect Bea’s response had on their lives? Overall, this is a wonderful twist on the prodigal son story. It is an original concept which is refreshing in the world of literature and is well-written and definitely keeps the readers interest throughout the novel. Well done, Deborah Bedford! If you haven’t read this book yet, make it a priority to find it in your bookstore soon!